I don't know about you all but Halloween is my favorite. Fall weather, pumpkin patches, pumpkin spice errrythang, Halloween parties, scary movie marathons, Halloween decorations, all the candy. I LOVE IT ALL. I've always been really into dressing up. I'm decently creative so I would think of my costumes (yes, plural) months in advance. I haven't really had time to do any of this planning this year since we are moving in about two weeks (!!). That being said, I put together this list of easy costume ideas for the girls just like me - a little lazy this year, still want to look cute, still want to be comfortable, and still don't want to break the bank. 1.Vintage Hooded Flannel. COSTUME IDEA: HOBO/BUM. You probably have all the elements for this costume in your closet: ripped jeans, oversized flannel, beanie, and maybe some combat boots. I love that this flannel is hooded! Note: this is a men's flannel so you may want to size down. 2.Waffle Beanie Hat. Complete the hobo/bum outfit with a waffle beanie. The ones at Urban are so inexpensive and you could definitely wear this all throughout winter so it's not like you're paying for a part of a costume that you'd never wear again. 3. Velvet Leopard Bodysuit. COSTUME IDEA: CAT/LEOPARD TYPE DEAL. Basic but who cares. Under $30!! A cute outfit that can double as a Halloween costume. I love this bodysuit! Complete this outfit (or costume) with black ripped jeans, black leather jacket, and some cat ears. 4.Black Glitter Cat Ears. See #3 above. Throw on some cat ears and call it a day. It doesn't get any easier than this! You could even go sans body suit and just wear these cat ears with any outfit, honestly. 5. Blame It On The Boos Graphic Tee. COSTUME IDEA: YOURSELF. I am all about terrible (yet awesome) puns so this may be my favorite item on the list. This t-shirt is comfy, casual, and straight to the point: you're here to party. 6.X-Ray Vision Sweatshirt. COSTUME IDEA: CUTE PINK SKELETON. I am obsessed with this!! It's a little on the pricier end but the quality of wildfox sweatshirts are UNREAL. They are soo soft and cozy so this would be worth the splurge. Also, I like that this is pink and not black. This definitely stands out from all the black and orange you'll be seeing for Halloween . 7. High Rise Distressed Skinny Jeans. These would be perfect for the hobo outfit but also would work with the pink skeleton, or the leopard jumpsuit. Overall, these Levi's are just a closet staple and I would wear these in my every day outfits all throughout Fall. 8. Draped Faux Leather Jacket. COSTUME IDEA: CAT, BIKER, GOTH, WITCH, ETC. Another Fall staple that is ON SALE! Pair this with the leopard body suit, black ripped jeans, and cat ears. Or you could even wear all black and be a biker or goth. 9. Ripped High Waist Black Skinny Jeans. COSTUME IDEA: See #8 above! Another closet staple that can help complete so many easy and cute costume ideas. 10. Halloween Skeleton Bodycon Dress. COSTUME IDEA: SKELETON, DUH. This bodycon gives the illusion you really tried to dress up and look cute but it's still so easy and cute. Bonus points for added effort of adding face paint. Add THESE ADORABLE TIGHTS to stay a little warmer! 11. Care Bear Women's Onesie. COSTUME IDEA: CAREBEAR, DUH. The one day a year you can get away with wearing PJ's... specifically a onesie?! I'm in. Target has so many cute ones and they're under $30! 12. Witch Hat. COSTUME IDEA: WITCH, DUH. This would look so cute with the Pajama Set in #16, the cropped top in #15, or even with the the black ripped jeans, leather jacket, and black top. 13.Red Wool Beret. COSTUME IDEA: MIME. Pair this with a striped tee and black skinny jeans and you've got yourself an outfit. Again, added bonus points for throwing on some mime-like face paint. 14. Betsey Johnson - Halloween Earrings Set. So this isn't a costume idea but these are still a cute little addition to any of these outfits. 15. Halloween Pocket Cropped Tee. COSTUME IDEA: PUMPKIN? IDK? This isn't so much an actual costume but still a cute and easy tee to throw on for the occasion. Also comes in white with a black little ghost on the pocket which I thought was cute too! 16. Spell Yeah Pajama Set, COSTUME IDEA: WITCH. Another pajama set that you can get away with wearing throughout the day and night as a costume! Pair this with the witch hat and you've got yourself a full costume. 17. Striped Ringer Tee. COSTUME IDEA: MIME. This paired with the beret and black ripped skinny jeans would be the cutest mime costume! And there you have it, friends. 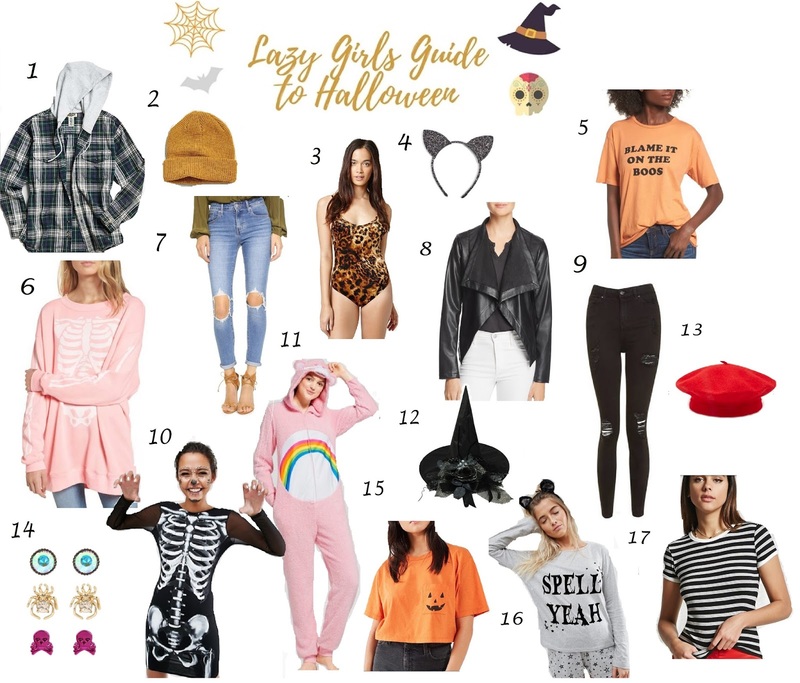 My lazy girls guide to Halloween. Hope you found some costume inspo! What are some of your Halloween plans? Nice picks! Thanks for the inspiration! This is so cute! I don't really have any plans for Halloween, but I'm loving all the cute graphic tees! Literally same here so I was just thinking of getting the graphic tee in #5! Hahaha me too girl ugh!! Glad I am not the only one! I'm a lazy girl and I already got my skeleton dress. This is a great post, I love the graphic t-shirts! Nice pics! Amazing inspo for hallween!! What great options! I am definitely lazy when it comes to these things. Isn't it cute?! Thanks girl! I'm not usually big on costumes so these ideas are just perfect! These are all great ideas! I love that pink skeleton sweatshirt, so cute. I love that too! Thanks, girl! Those are some really cool and easy ideas but I just can't be lazy with halloween! This is a really good guide for a last minute kind of costume. I'm always so last minute when it comes to my halloween costume!! Love these ideas you came up with babe ...I'll be needing to finalize this week hahah ...late as always! I can't wait to see what you do !!! So good ideas! Thanks for sharing! I love this idea of easy Halloween outfit ideas as It always seems to creep up on me and before I know it it's the week of Halloween and I don't have anything planned! I don't typically go out for Halloween but I like to dress up for the kiddies that come to my house to trick or treat! Yessss that's totally how I felt this year!! Glad I'm not the only one haha! So fun you dress up for trick or treaters - when I have a house I will definitely be doing that! Love your picks! So many great ideas! Haha - I'm right there with ya girl! Can't wait to see what you dress up as!!! I love this! We're going ALL OUT this year with our costumes, but I love the idea of lazy Halloween that is cozy + easy to pull off! Ahh I love halloween too! All of these are just so cute, I want to get some cute cat ears :) They sell adorable ones at Francesca's! Omg you're so right I always forget about Francesca's!! Can't wait for Halloween <3 yaay! Aw thanks girl!! I got the plaid hoodie and it's sooo comfy! I love halloween!! Wish we had this in the Netherlands. I love the kitty glitter ears! They are so cute! I love Halloween but hate anything flavored with pumpkin though. I am really in to creepy crawler costumes. Basically anything featuring spiders. I wish I saw this much sooner! I'm definitely lazy to make an effort for Halloween! That was definitely me this year!! waoo wishlist is supper dear great posting..
Great picks hun! Spell yeah tee is my fave! I love that Blame it on the Boos saying! Haha that's the first time I heard of it! Cute! Isn't that cute?! I'm a sucker for lame puns like that haha! These were all great costume ideas!! I LOVE the Care Bear onesie! SO CUTE! Definitely trying these out for next year! Halloween is always so fun! What a cute care bear onesie!